Home > Fire Safety & EMS > Fire Safety Evacuation Supplies & Tools > Fire Extinguisher Cabinets & Covers > FireTech FT926 Surface Mount Metal Fire Extinguisher Cabinet - 10 lb. Home > Fire Safety & EMS > Fire Extinguisher Cabinets & Covers > FireTech FT926 Surface Mount Metal Fire Extinguisher Cabinet - 10 lb. Home > Fire Extinguisher Cabinets & Covers > FireTech FT926 Surface Mount Metal Fire Extinguisher Cabinet - 10 lb. FireTech FT926 Surface Mount Metal Fire Extinguisher Cabinet - 10 lb. FireTech™ FT926 Metal Fire Extinguisher Cabinets are constructed of 20 gauge galvanized steel with a rust-resistant white finish and a scored clear polystyrene break front. 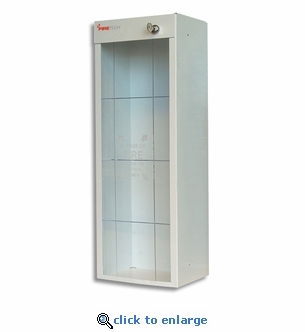 Use these quality surface mount extinguisher cabinets indoors or out to protect your 10 lb. fire extinguishers and make them noticeable and easy to access. Breaker bar sold separately. Scored acrylic break front with silk-screened instructions. Use with: 10 lb. fire extinguishers. FireTech FT916 Surface Mount Metal Fire Extinguisher Cabinet - 5 lb. FireTech FT936 Surface Mount Metal Fire Extinguisher Cabinet - 20 lb.